Komba, Coretha and Edwin Muchapondwa. 2015. 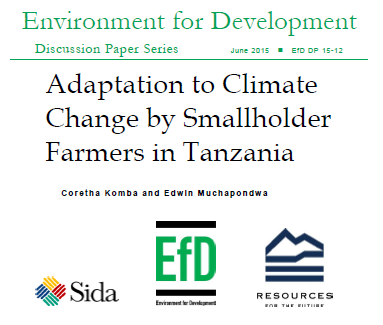 “Adaptation to Climate Change by Smallholder Farmers in Tanzania.” EfD Discussion Paper Series EfD DP 15-12. In Sub-Saharan Africa, climate change is set to hit the agricultural sector the most severely and cause suffering, particularly for smallholder farmers. To cushion themselves against potential welfare losses, smallholder farmers need to recognize the changes already taking place in their climate and undertake appropriate investments in adaptation. This study investigates whether these smallholder farmers in Tanzania recognize climate change and, consequently, adapt to it in their agricultural activities. The study also investigates the factors influencing their choice of adaptation methods. In order to achieve this, the study analyzed data from 534 randomly selected households in a sample of districts representing six of the seven agro-ecological regions of the country. The data shows that Tanzanian smallholder farmers have observed changes in mean and variance precipitation and temperature and have responded to it. The farmers have generally used short-season crops, drought-resistant crops, irrigation, changing planting dates and tree planting to adapt to the negative impacts of climate change on their agricultural yields. In this study, selection bias is corrected using a Heckman sample selection model. A binary probit model is used as a selection equation to investigate the factors influencing a farmer’s decision to undertake any adaptation at all to climate change, while a multinomial probit model is used as an outcome equation to investigate the factors influencing farmers’ choice of specific adaptation methods. The inverse Mill’s ratio reported selection bias in choosing three of the adaptation methods. The findings of the study suggest that the Tanzanian government needs to help smallholder farmers overcome the constraints they face in their attempts to adapt. The government can play a significant role by promoting adaptation methods appropriate for particular circumstances, e.g., particular crops for different agro-ecological zones.